It is inevitable that a seawall or bulkhead will need repair at some point. Sometimes the cost and disruption of an excavation repair or replacement make those options impossible or undesirable. That was the case with the busy Port of Palm Beach. The project engineer approved the use of chemical grouting to address significant problems with the port's seawall. Seawall Doctors of Boca Raton used probe grouting with Prime Flex 920 to solve the problem while saving the port authority tens of thousands of dollars. Problem: The Port of Palm Beach is the busy base of operations for many different types of businesses. These range from container shipping to cruise ship departures. One of its clients refurbishes luxury yachts. The port engineer found significant cracks in the seawall adjacent to this client’s main work area. The cracks created major voids behind the wall as the tidal activity washed away loose soil. Solution: Port officials contracted Seawall Doctors to repair the seawall. The company could have done a rehabilitation using excavation and backfill and some type of sheet pile or a cementitious patching of the concrete. However, besides being disruptive to the port’s operations, particularly those of the client in that area, such a large-scale rehabilitation is an expensive proposition. In addition, depending on the repair method chosen, patching might be only a short-term solution. Seawall Doctors recommended curtain grouting the seawall using Prime Flex 920, an expansive polyurethane foam, to fill the voids, stabilize the loose soil, and seal the cracks in the seawall. When reacted, the hydrophobic foam forms a rock-hard watertight mass. The crew initially pumped Prime Flex 920 with probes in five locations. This filled the original void, the known cracks, plus fissures underwater that had not yet been discovered. A floating boom contained any reacted grout, which is inert, as it flowed through the cracks in the seawall. Seawall Doctors and port officials chose Prime Flex 920 a crew curtain grouts with polyurethane foam to repair a seawall because it is certified compliant with NSF/ANSI Standard 61 for contact with potable water. Though the waterway is not a source for drinking water, choosing an eco-friendly product to use was an easy decision. After the initial grouting phase, port officials chose to have additional grout installed to fill other voids and ensure the sealing of cracks not yet discovered. Outcome: The crew completed the project successfully over three days without disrupting port operations or interfering with the client’s job of getting a luxury yacht back on the water. The port authority official said this solution saved $100,000 from the other options that were explored. Floodwater that infiltrates leaking manholes costs thousands of dollars as it flows through the manhole into the city’s wastewater treatment system. Studies done in the USA show that up to 40% of groundwater infiltration in sewer systems enters through manholes. With Prime Resins grouting (and other solutions), manhole leaks can be permanently stopped in a matter of minutes with immediate cost-savings. 1. Gushing Leaks – fix a gushing leak in a manhole with Prime Resins 920 or Prime Flex EXP. These products rapidly expand to stop gushing leaks then cure to form a rigid, watertight foam. 2. Slow Leaks – stop water leaking through small cracks in a manhole with Prime Resins “Prime Flex XLV”. This low-viscosity resin reacts with water outside of the manhole barrel and forms a flexible, closed-cell, watertight foam that seals the manhole and stops the leak. 3. Leaking through the Manhole Chimney or Grade Rings – eliminate infiltration through the grade rings of precast manholes using APM’s I/I Barrier chimney seal. 4. Corroded or Deteriorated Manholes – Microbiologically Induced Corrosion (MIC) corrodes sewer and sanitary manholes. The corrosion on the concrete occurs when hydrogen sulfide gas (H2S) is converted into sulfuric acid (H2SO4) by Thiobacillus bacteria that grow on the concrete surfaces above wastewater flows. You have the option to quickly and efficiently reline a corroded manhole with APM Permacast centrifugally-cast concrete liner. Erosion never gets better on its own. Erosion always accelerates and makes things worse. Culverts can only manage storm water when the surrounding soils are stable. The soil around culverts needs attention and inspection after a flood event. If the soil around the culvert has begun to erode, proactive repairs need to be initiated to make sure the culvert doesn’t wash out during the next flood. Normally, soil that is carried away from a culvert by groundwater will result in the settlement, slumping and potholes in the roadway above. The worst case scenario is if a culvert fails during a heavy rainstorm or flood event which results in a washout with a lot of expensive damage to the road and possibly people driving on the road. Martech strongly recommends initiating an inspection and repair program for your culverts and spillways. If the soil around any culvert is weak or eroded away, inject Prime Resins grout resin around the culvert to fill in voids and stabilize the soil. Preserve your culverts so they can do the job they were designed to do – channel water safely from one place to another! You can stop a road from washing out. Proactively reinforce the soil under roads, paths, walkways and other infrastructure using permanent soil stabilizing foam. The foam resin is injected underground where it bonds with soil to create a permanent, solid wall underground to hold soil in place, prevent erosion and prevent damage on the surface from instability below the ground. The environmentally-friendly foam resin is injected underground where it expands, bonds with the soil and then hardens to form a permanent, stabilizing layer of solid, rock-like material inside your riverbanks. This May, spring rains caused significant amount of subsurface erosion at a Calgary truck weigh station. This erosion weakened the soil that supported the weigh station. With heavy trucks sitting on the weigh scale day after day, the concrete piles under the scale began to shift and sink in the unstable ground. Calgary-based contractors Concrete Specialists were called into action with Martech and Prime Resins to fix the unstable weigh scale and stop it from sinking into the ground. Soil stabilization diagram: 1) Surface water infiltrating the soil and eroding away supporting material from below weigh station’s concrete piles. 2) Prime Resins “Prime Flex 920” grout injected 24” below the base of the pile. 3) Grout expands and fills underground voids then hardens with the soil to form a new base for the concrete pile. The foam-fortified soil reestablishes the necessary frictional forces around the pile for long-term stabilization. Resin expands and hardens underground. Do this for all eight pillars, injecting a total of 200 gallons (about 25 gallons for each). Soil is now stable, the concrete pillars will no longer further sink or shift. Now the weigh scale is being monitored to ensure success. We are following up with the client every three months. Soil stabilization contractors using 14" long soil probe to inject Prime Resins "Prime Flex 920" grout into the ground and create permanent solid base for the weigh scale pillars. After the Prime Flex 920 grout is injected, the resin fills subsurface voids, expands and hardens with the soil to become a solid foam block underground that supports the weigh scale pillars. EJ fire hydrants are lightweight and easy for field operators to maintain. Typical fire codes require all hydrants to be operated and inspected annually. This requires city crews to test and repair hundreds of hydrants every year. EJ hydrants make this work faster and less expensive. Made from ductile iron instead of heavy cast iron, EJ hydrants can easily be disassembled and moved around by one person. Do you know many parts are out there in a typical hydrant? Between 80 and 120 parts! EJ’s simplified hydrant design uses less than 40 parts. This means that the hydrants are easier to learn and repair and maintenance jobs are faster and less complex. Only 40 parts to purchase, inventory and store in city public works depots and trucks. Managing hydrants that only use 40 parts is a lot easier than hydrants that use 80 to 120 parts. EJ and Martech can reduce your hydrant workload. Is your town or city facing challenges with hydrant testing and maintenance? One of the main advantages of relining with CentriPipe is that the culvert’s capacity is preserved – the concrete liner does not significantly reduce the culvert’s diameter or capacity. 48" CMP culvert relined with centrifugally cast CentriPipe concrete liner. No significant reduction in flow capacity. About half a kilometer up the road, this 48" culvert was rehabilitated with a slip-lining solution. This culvert's ID was reduced from 48" to 30". The CentriPipe culvert's new ID is 46". Compared to the CentriPipe centrifugally cast concrete culvert, the slip-lined culvert is 35% smaller (30″ compared to 46″). This translates in a 58% difference in flow capacity between the two relined culverts (3.6 m3/s with CentriPipe down to 1.5 m3/s with slip-lining). If keeping a culvert’s high flow capacity is important to you, please consider CentriPipe centrifugally cast relining. Martech represents APM CentriPipe in Canada. If you have deteriorating culverts in your area, ask us for help in getting your culverts repaired with CentriPipe. Are you paying to treat groundwater that leaks into your sewer and wastewater treatment system? In the spring time, most people are excited about the snow melting and summer starting, but it also means more leaking manholes for municipalities, (especially in areas that have a high water table). This costs a lot of taxpayers’ dollars. One manhole has a ¼” diameter hole. 225,000 gallons of groundwater leaks into the sewer system through this manhole every month. An average water treatment cost is about $1.75 per 1000 gallon, so this single ¼” diameter hole is costing the owner $393.75 per month. If your system has 5 leaking manholes, you’d be spending an extra $1,968.75 to treat the groundwater that leaked into your system. A lot of people don’t recognize this problem and realize just how much they are paying to own a leaking manhole. One of my local municipalities in Northern Alberta has about 200 manholes. Over 60% of their manholes are leaking groundwater into their sewer system. By stopping the ingress of groundwater into their wastewater treatment system, their investment can be paid back within a couple of months. If you look at the math, we can help save hundreds of thousands of dollars for this municipality within a year. Balaji Krishnamurthy led a Seven Secrets to Successful Leadership session in Edmonton. We help our customers grow their businesses. This spring, Martech helped arrange for 73 business leaders to with meet proven world-class leadership expert, Mr. Balaji Krishnamurthy. This session was created so these 73 people could learn and apply Krishnamurthy’s Seven Secrets to Successful Leadership in both their personal and business lives. 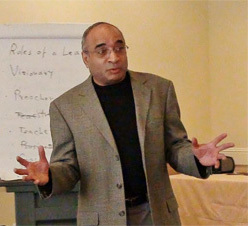 Several years ago, members of Edmonton’s TEC Group had the pleasure of hearing Krishnamurthy teach on the topic of intentional leadership. This topic inspired me and I decided to attend Krishnamurthy’s in-depth L3 workshop to explore, identify and shape my own unique leadership style. On May 30, 2013, leaders from the Edmonton region met to align and continue the development of their leadership skills. The leaders were inspired to commit to one personal action item for each of the Seven Secrets. The action is to move them to being the leader they aspire to be. Additionally, each leader was offered the choice of meeting with a local TEC Member to serve as a coach to achieve their 7 individual growth ambitions. Congratulations to those leaders that attended and to the companies that invested in their leadership. If you are interested in participating in upcoming leadership workshops, send your info to Martech and you will be included on our leadership development mailing list. Cracks in basement walls and floors is fairly common in homes older than 10 years. 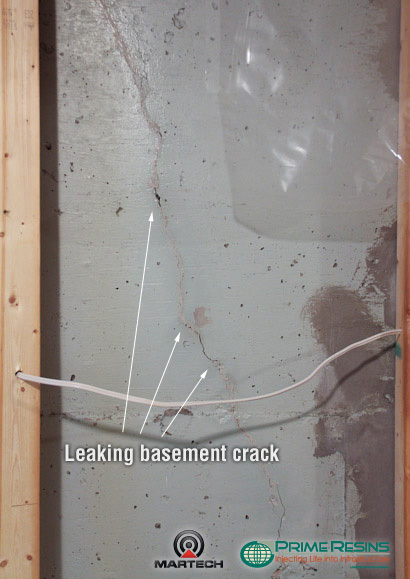 Well designed basements actually develop hundreds of distributed hairline cracks as the concrete walls age and shrink. Sometimes, though, a crack forms that is large enough to allow groundwater to leak into the basement. Some people fix these basement cracks with epoxy. Epoxy is a strong material, but it is very rigid when cured and cannot flex with the wall. Future movement in the structure will result in another crack in the wall next to the epoxy. Prime Flex 900 XLV is a thin liquid resin that reacts with moisture and expands to form a closed-cell, watertight foam. When cured, 900 XLV forms a hard but flexible foam that can move with the structure. 900 XLV is usually used to seal actively leaking joints and cracks in concrete structures. The 900 XLV resin from Prime Resins is ideal for concrete crack repair jobs where there is potential for future movement and settling in the structure. In the photo gallery below, you will see a Prime Resins leak-sealing repair job in a basement that had lots of vertical cracks in all four walls. *NOTE: if your basement has a large horizontal crack in the wall, you should seek advice from a foundation contractor or structural engineer. A horizontal crack could indicate the wall is about to fail. Leaking basement crack prior to preparation and repair. Crack is prepared and holes are drilled for resin injection. Starting at the bottom of the wall, Prime Resins 900 XLV is injected into the basement crack through the holes. Resin foam expands outside the wall to seal the crack in the concrete basement wall. Note the foam has sealed a crack in an old expoxy surface patch seal. After injection, the cured foam and injection ports are cut off the wall to leave a clean, dry surface. The leaking basement wall has been fixed. If you have cracked basement walls that leak, please contact Martech to find a company that can fix your basement with Prime Resins 900 XLV. Repair leaking water lines quickly and easily with the next-generation Versa-Max repair clamp/coupling. Depressurizing a water main to fix a leak causes a lot of extra work. When a line is cut or depressurized, the utility will employ stringent standards and protocols to preserve water quality and safety. Some of the more expensive construction procedures include mats under pipes, chlorination after the repair, extra procedural efforts to keep dirt our of the pipe, notifying all affected residents about the service interruption and increased sampling and testing of water to ensure quality assurance. The preferred pipe repair method is to fix the leaking pipe while it’s still under pressure. Installing a repair clamp can be tough if you are repairing a pipe that’s still pressurized. Water is spraying out and placing a repair fitting onto the pipe is not fun. Versa-Max helps make this job go easier and take less time. Versa-Max is a next-generation all-in-one wrap-around pipe repair clamp AND push-on pipe coupling. To use it as a clamp, simply open and wrap the fitting around the pipe, no disassembly is required. Placing and tightening the clamp on a pressurized line gets a lot easier with the convenient two-stage retainer assembly on the Versa-Max. First, open up the clamp and wrap it onto the pipe. Close the clamp to the first stage of the retainer assembly. Now the clamp is closed, but not tight. It won’t pop open and you can adjust the fitting as necessary. When you’re ready, push the clamp closed into the second position on the retainer assembly and tighten the lug bolts. Doing a pipe repair with Versa-Max means no service interruption or water quality issues. Martech exhibited the TPS Versa-Max repair clamp/coupling at the 2013 BCWWA Conference in Kelowna on April 20-24. 2.wrap-around pipe repair clamp that waterworks operators use to repair breaks in their water pipelines. Call your Martech sales representative to arrange a lunch & learn session with a hands-on demonstrationof the Versa-Max coupling/clamp solution. BCWWA CONTEST RESULTS: WHO HAD the FASTEST VERSA-MAX TIME? With a hyper-fast install time of 6.6 seconds, Randy Smith proved his pipe-repair skill and won Martech’s Fastest Clamp Contest! We called Randy to congratulate him on his victory and to ask him a few questions about his performance. A: “I used Ez-Max repair clamps before, had familiarity with that type of clamp product. “We have a water main going across the creek. The 4″ tubing often breaks (always at a bad time, spring time when the water is high and cold). My teammate and I have to repair that line, sometimes with a snorkel and wet suit. Anything that can make the repair faster is better. We can’t turn off the pressure (can’t have negative pressure on the water line) so putting this clamp on quickly with water spraying out isn’t always easy. Well done everyone! Thank you for testing the Versa-Max pipe repair clamp/coupling with us at BCWWA! Are you keen on pipe repair? Watch this Versa-Max installation video before you come to the BCWWA trade show and wow us with your speed and skill! Versa-Max is an all-in-one product that does the job of a pipe coupling and a pipe repair clamp. Thank you for stopping by our booth to try out the new Versa-Max all-in-one repair clamp and coupling and learning about our new Helix Labs wastewater grease and odor management options. MARTECH provides innovation for municipalities in the construction, operation, maintenance and repair of their infrastructure. We look forward to continuing our connection with you and assisting all BC Operators with infrastructure innovation in 2013 and beyond. Matt Jones will be following up with you to advance the projects you discussed at this conference this week. Contact Matt Jones to arrange a meeting or learning session with you and your department. Matt Jones and Glenn Votkin with the Martech exhibit at BCWWA in Kelowna. Matt Jones and Glenn Votkin talked with utility managers and operators at the BCWWA Conference earlier this week. Matt and Glenn were showing Helix Labs biological grease & odor management products and the new TPS Versa-Max pipe repair clamp/coupling. If you work on sewer line, lift station or water line maintenance and repair – don’t wait for BCWWA’s next conference in 2014 to try Helix Labs grease & odor management or Versa-Max pipe repair clamp/coupling. Contact us and ask Martech to hook you up with a trial order package! Grease. if it’s not treated as solid waste, it’s dumped into your water treatment system when home owners and commercial businesses rinse grease down their drains with hot water! Photo: Examples from Canada and the United States of grease, fats and oil buildup restricting the flow of wastewater in sewer lines. Liquid grease solidifies at 13°C (55°F), floats on water and adheres to sewer lines. Grease buildup in sewer pipelines reduces the capacity of the line and restricts the flow of wastewater (increasing the risk of overflow). Grease layers that break off can create total plugs downstream (creating a sanitary overflow event!). Helix Labs is a science-based company with an environmentally friendly philosophy. Helix Labs produces biological alternatives to jetting, vacuuming and other mechanical grease removal methods. The Helix bacteria literally “eat the grease problem for breakfast”. Photo: Example of lift station BEFORE rapid grease buildup problem (12" of grease vacuumed off every week) and AFTER Helix Labs 'shock dosage' of grease eating bacteria. The result: dramatic reductions in grease buildup! On a typical sewer line or lift station, the time between jetting or vacuum service is increased from once every 30 days to once every 6 months. Versa-Max is an all-in-one product that does the job of a pipe coupling and a pipe repair clamp. Martech showed off the TPS Versa-Max repair clamp/coupling at the 2013 BCWWA Conference in Kelowna on April 20-24. CONTEST: HOW FAST CAN YOU INSTALL A VERSA-MAX? Visit our booth during the BCWWA trade show and try your hand installing a Versa-Max! Start with your VersaMax closed and nuts finger-tight. Tighten all four nuts with your fingers. Best installation time WINS THE PRIZE – a new Apple iPad 2 ($529 value) for the fastest Versa-Max installer! Visit Matt Jones from Martech at BCWWA Booth #810 for a hands-on demonstration of the Versa-Max coupling/clamp solution. Martech brings Hymax, Ez-Max and Versa-Max pipe repair couplings and clamps to Saskatchewan distributor trade show. Martech's Don Anderson demonstrates the TPS Ez-Max pipe repair clamp for trade show attendees. Last week, Martech exhibited TPS pipe repair products at a Saskatchewan distributor’s trade show. The group at the show saw how Hymax, Ez-Max and Versa-Max pipe repair couplings and clamps were designed to be easy for the field technician to install for long term reliability. Pipe break requiring new section of pipe: use Hymax or Versa-Max couplings to couple in the new section of pipe. Small break not requiring new section of pipe: use Ez-Max repair clamps to clamp over the crack and stop the leak. Small break where pipe is deflected at angle between 0° and 3°: do not couple in a new section of pipe. Instead, use Versa-Max repair clamp (this clamp can handle 3° deflection in the pipe). Total Piping Solutions (TPS) is a pipe repair leader in North America. Their Hymax couplings set the industry standard for ease-of-install and reliability. Martech’s Don Anderson is actively connecting with municipalities, pipeline owners, operators and distributors in Saskatchewan and Manitoba to make sure they have the best options for pipe repair clamps and couplings. If you have a question about pipeline repair hardware, please contact Don today. The final release of air through an air valve produces a pressure surge. This phenomenon, called “air slam”, is caused by the rapid deceleration of liquid in a pipeline at the instant the air is fully expelled from the line. Air slam produces a pressure surge similar to the one produced by the rapid deceleration caused by a valve closure. If air is released too quickly from the line, excessive air slam pressure surge can occur. Proper sizing and placement of air release valves is necessary to avoid excessive air slam pressure surges. If air slam is a risk, choose an air valve with a non-slam device to reduce the surge impact within the pipeline, extend the pipe’s service life and lower the chance of a water main break. A new high pressure water line is transferring water in Alberta’s Peace River region. A typical air valve would not be able to handle the pressure and surge within this pipeline. The design engineer worked with Martech and ARI to developed a workable solution for this pipeline with the new D-060-C-HFNS-03-SB air valve. This air valve is designed to handle high pressures, high flow and it is also designed with non-slam protection for to reduce the effect of air slam pressure surge. The direct bury air valve kit reduced the manhole barrel height for easier maintenance. One other interesting note: we also used EJ ERGO locking manhole frame & cover for this project. This will improve safety and prevent intrusion! ARI is represented in Canada by Martech. Send a request to Martech for more information about ARI’s innovative, reliable air valve products. Thank you for your interest! Martech exhibited the TPS Versa-Max repair clamp/coupling at the 2013 AWWOA Conference in Banff on March 11-15. Call your Martech sales representative to arrange a lunch & learn session with a hands-on demonstration of the Versa-Max coupling/clamp solution. CONTEST RESULTS: WHO HAD the FASTEST VERSA-MAX TIME? Wayne Donald wins new Apple iPad 2 in the Versa-Max Fastest Clamp Contest at AWWOA. With a blazingly fast install time of 14.0 seconds, Wayne Donald from Edson, Alberta proved his unassailable pipe-repair chops and won Martech’s Fastest Clamp Contest! We called Wayne to congratulate him on his victory and to ask him a few questions about his performance. A: “I felt pretty good to be that much faster than everyone else there. 14 seconds is fast, I was happy. I wasn’t holding my breath because I felt sure someone else would have a faster time. I could have done it faster if I did it a second time”. Martech would like to extend an honorable mention to Omar Safod from Syncrude. Omar placed second with a very quick Versa-Max installation time of 15.9 seconds. Well done everyone! Thank you for testing the Versa-Max pipe repair clamp/coupling with us at AWWOA! Are you keen on pipe repair? Watch this Versa-Max installation video before you come to the AWWOA trade show and wow us with your speed and skill! We look forward to continuing our connection with you and assisting all Alberta Operators with infrastructure innovation in 2013 and beyond. Derek Traquair (Southern Alberta) and Liang Yu (Northern Alberta) will be following up with you to advance the projects you discussed at this conference this week. Feel free to contact Derek or Liang to arrange a meeting or learning session with you and your department. About 18 months ago, Nicholas A. Willis was starting his new job as Stormwater and Conservation Superintendent in Hays, Kansas. Willis decided to take a closer look at the stormwater sewers underneath the picturesque brick streets in the city’s center. The 48″ arched corrugated metal pipe (CMP) sewer was just over 50 years old, according to city records. 50 years is near the maximum lifespan for CMP, so Willis wasn’t expecting to find the pipe in perfect condition — still, what he did find surprised him. The system-wide inspection revealed about 300 feet of collapsing sewer that was immediately addressed by trenching and replacement. And with that work done, there was still several thousand feet of pipe with rotted-out inverts or other significant damage. Some of it ran underneath brick streets for hundreds of feet and replacement by trenching would have been expensive — about $490/foot — and would have seriously disrupted downtown traffic. CentriPipe is a proven centrifugally cast concrete pipe (CCCP) rehabilitation method developed by AP/M Permaform. A spincaster is inserted at one end of the pipe and pulled through at a calculated speed to apply thin layers of structural grout or epoxy mortar. The finished product is smooth, tightly bonded, waterproof, and it doesn’t significantly reduce the pipe’s inner diameter or flow capacity. It’s especially efficient and cost-effective on large diameter pipe. The Florida Department of Transportation, for example, has used CentriPipe to rehabilitate sewers up to 13 feet in diameter. Crucially for Hays, CentriPipe is completely structural and adheres tightly to most substrates, including CMP. It’s as if a new concrete pipe is built into the sewer. The condition of the old, deteriorated pipe doesn’t affect the performance of the new CentriPipe concrete liner. In 2011, Willis decided to test CentriPipe by rehabilitating 968 feet of 30 and 48 inch sewer pipe before selecting it as the prime solution for all of Hays’ failing sewers. Since the CMP in Hays is arched and concrete is applied by a spincaster, Willis says the new concrete was thicker ‘at ten and two’ but that this doesn’t really affect performance. Most pipes required two or three passes, one to fill in and smooth out pipe corrugations, and one or two additional layers to add strength. One-inch layer thicknesses were specified, and inspection was done with a fairly low-tech method. Finding out that you’ve inherited a sewer system with failing pipe — and some pipe that has actually crumbled and washed away — isn’t the most pleasant way to start a new job. But Willis adapted quickly and has already addressed the most critical pipe in the system. APM CentriPipe and APM Permaform culvert and manhole rehabilitation products are represented in Canada by Martech. Please ask Martech to help make your culvert rehab project a success. Prime Resins Equalizer Flush means better efficiency and less material required when lifting concrete slabs with Precision Lift polyurethane foam. Equalizer Flush is a biodegradable flushing solvent for cleaning Prime Resins pumps, hoses and applicators. During Precision Lift slab lifting jobs, Equalizer Flush can also be used as a surface lubricant to prevent the cured resin foam from bonding on the concrete slab. By preventing a bond between the cured foam and the surface of the concrete, the lifting performance of the foam becomes more efficient. Less material is required when using equalizer for the same amount of lift. Lower cost for end-users and owners. Cleaner results on the concrete driveway, sidewalk and floors after the slab lifting is finished. Measure gaps, ridges and joints in the concrete driveway. Drill holes through concrete into subgrade. Inject Equalizer Flush into the subsurface void before injecting the Prime Resins expanding polyurethane resin. Prime Resins Precision Lift resin has been injected under the slab and it is expanding and lifting the concrete driveway slab. Due to the presence of Equalizer Fush solvent, the foam is NOT bonding to the concrete and the lifting process is more efficient. Finished job, the concrete driveway slabs were lifted back to a flush grade with Prime Resins Precision Lift foam and Equalizer Flush. The Lac La Biche utilities department had pipeline efficiency problems in several sections of their wastewater collection and treatment system. These lines were operating at reduced capacity due to accumulated air and gas inside the pipes, forcing lift station pumps to work harder to achieve minimum flow rates. Watch this YouTube video to see how air affects pipe capacity and pump load. Installing combination air release valves on these pipelines was the correct course of action. The utility selected the A.R.I. D-020 Combination Air Valve for Wastewater. They installed the valves onto the pipe using a tapping sleeve (to add a flanged opening into the pipe) and isolation valve (to close the hole in the pipe during air valve maintenance). This is a common installation method in Canada to add A.R.I. air valves to an existing pipeline. Start of installation: tapping sleeve installed on pipe. Tapping sleeve is installed and ready for isolation valve and air valve to be bolted on. A.R.I. D-020 air valve (green) and isolation valve ready to be lowered into manhole chamber. Air valve being lowered into manhole with rope. A.R.I. designs and manufacturers air valves that work reliably to ensure the efficiency of water supply and wastewater disposal systems in both urban and rural environments. Use ARI air valves in your next water pipeline or pump station project. A.R.I. is represented in Canada by Martech. Use the “LEARN MORE” form on this page to ask Martech for air valve selection and placement advise. We will connect with you and help determine which air valve will fit with your design. HOW DOES THE D020 AIR VALVE ACTION WORK? The D-020 Combination Air Valve combines an air & vacuum orifice and an air release orifice in a single body. The valve is specially designed to operate with liquids carrying solid particles such as wastewater and effluents. 1) The D020 combination air valve discharges air when the pipeline is filling and releases accumulated gasses while the line is under pressure and operating. 2) Filled pipeline raises float and closes air release mechanism. 3) Valve float lowers to admit air into draining pipeline. 4) The valve’s sealing mechanism never comes into contact with dirt and debris borne by the water. This reliable design prevents damage in the valve and ensures long-term operation. ARI is represented in Canada by Martech. Our infrastructure team is very experienced in pipeline design and air valve selection, placement and installation. We want you to have a successful project! Contact Martech for air valve selection and placement advise. We will connect with you and help determine which air valve will fit with your design. Calgary engineers designing a high pressure water line to service the rapidly expanding city of Airdrie used TPS Hymax pipe couplings and ARI D060 air valves to solve important problems in the pipeline design. Photo: TPS Hymax HYCO24 pipe coupling installed on new Airdrie high pressure water line. WHICH PIPE COUPLINGS TO USE ON A 24″ HIGH PRESSURE WATER LINE? The TPS Hymax HYCO24 pipe coupling is installed with 4 bolts by two people in about 45 minutes. This means the 4-bolt Hymax large-diameter coupling can be installed 90 minutes faster than its 12-bolt competitor. The Hymax coupling satisfied both the engineer’s and contractor’s demands. The couplings are installed easily and quickly in a trench that doesn’t need to be as deep as the competitor’s 12 bolt version. The labour savings realized during the installation of the Hymax pipe couplings saved money for the contractor and the municipality. The compression seal design in the Hymax pipe couplings allow up to 8° of deflection in the pipe (4° at each end of the coupling). As the heavy concrete chamber settles over time, the deflection allowance from the coupling means that the pipe won’t crack or rupture from stress at the coupling. Photo: ARI D060 air release vacuum combination valve being installed with the new high pressure water line. WHICH AIR VALVES TO USE ON A HIGH PRESSURE WATER LINE? ARI’s D060 high flow combination release/vacuum air valve was selected for this potable water pipeline. The air release function of the valve automatically releases pockets of air from the pipeline when it is full and operating under pressure. The vacuum component allows large volumes of air to flow in and out of the pipe during the filling or draining operations. This valve will open to relieve negative pressures if water column separation occurs. Martech represents both ARI and TPS in Canada. We want your pipeline construction projects to be successful. If you are designing a new water line, please contact us.